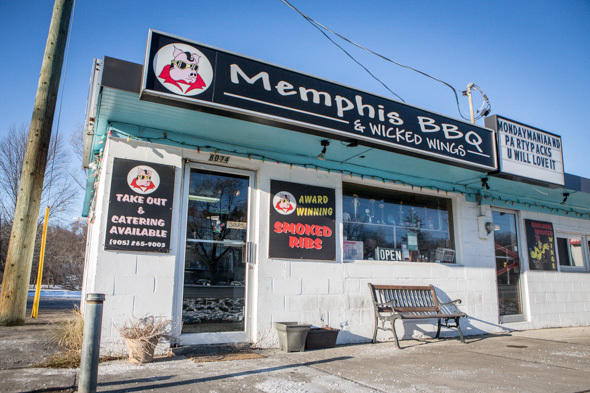 Memphis BBQ is a divey roadhouse on Islington - it's the original home of Big Bone BBQ , sold off to independent ownership once the Southern Ontario-wide chain took off. John Sidhu and sons Amar and Aran are the current proprietors - Aran having learned the ropes under the founding pit masters. Inside and out, the place captures an appropriately rustic, backwoods kind of vibe. 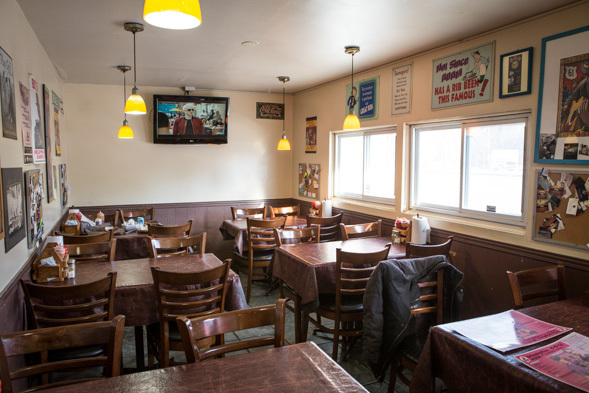 The wide narrow space is divided into two rooms; the first, a take-away counter and short order kitchen; the second with seating for about 20 in a compact space decorated with posters, newspaper clippings and eclectic memorabilia. It's the kind of place where tables are set with rolls of paper towels and wet naps. The Elvis Platter ($18) is the one of the best ways to sample an array of house specialties. The dinner (presumably meant for one) comes with three side ribs, half a pound of finely shredded, saucy pulled pork, and half a pound of wings (smoked or fried) with baked beans, cornbread, fries, and slaw. 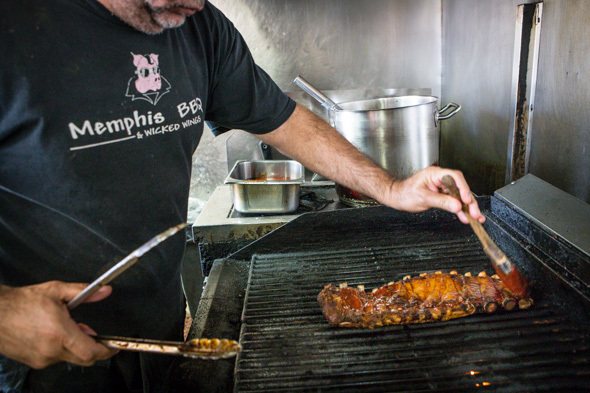 The ribs are great - the meat peels off the bone, while the Memphis-style BBQ sauce, deeply coloured and sweetened with molasses, is brushed on last minute and finished with a turn on the grill so that the sauce caramelizes and crisps up the edges. Skip the fried wings, which are unremarkable (though certainly welcome for variety sake when ordering a party pack). 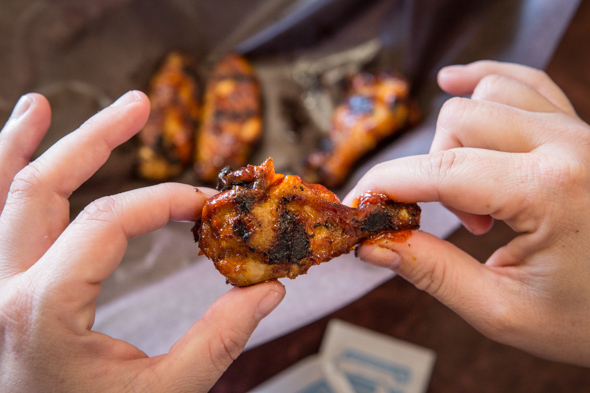 Opt instead for the house smoked wings, which marinate overnight before being smoked for four hours and then glazed and finished on the grill for a little flame-licked flavour. There's a tempting line-up of sandwiches and burgers too, though we're encouraged to go off menu and try the Fantasy Burger ($10.95) in a combo with onion rings and slaw. 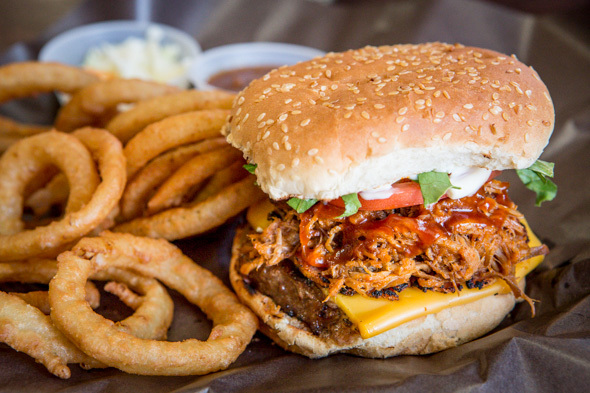 It's essentially a banquet burger, with cheese and peameal bacon, plus the entirely unnecessary but heavenly addition of pulled pork. 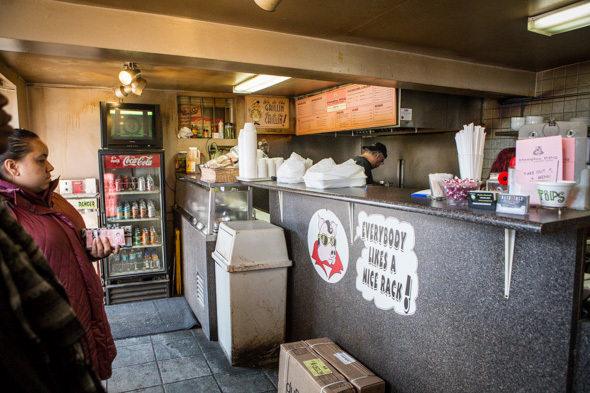 The place isn't licensed, so takeout is the best bet if your ideal feast includes a beer or two. Selling out is not unheard of - and neither are line-ups, so calling ahead for big orders is advised, especially during big televised sports events.